With the War of 1812 still fresh in the minds of the citizens of Baltimore, the proposal in 1818 to build a fort to protect Baltimore Harbor was warmly received. This new fort was intended to supplement the protection afforded by Fort McHenry, which had become engulfed by Baltimore’s expanding city limits. Support for the fortification grew over the next twenty years, and in 1841 Baltimoreans filed a petition with Congress for a garrison on Soller’s Point Flats in the city’s harbor. Construction of the fort, which was part of the Permanent or Third System of coastal defense, began in 1847, following an extremely ambitious plan. The blueprints described a four-acre, man-made island topped by a hexagonal fortress with forty-foot walls. The structure was to have four stories of tiered galleries capable of housing 350 cannons, and each of the fort’s sides was to be 246 feet in length. The construction supervisor was none other than Robert E. Lee, future commander of the Confederate Army. At the time, however, he only held the rank of brevet-colonel in the Army Corps of Engineers. For three years, Lee commuted daily from his townhouse in Baltimore to the work site. In 1850, the construction site was named in honor of Charles Carroll, a Maryland politician and the last living signer of the Declaration of Independence. Progress on the fort was slow. By 1851, only the structure’s foundation and first level had been completed at the substantial cost of $1 million. At this point, Congress started to reconsider the fort’s strategic placement, wondering whether it would be more efficient to have a structure near the Virginia Capes where it could guard more than one seaport. Congress was unable to come to a conclusion, though, and Lee took a new job as the head of West Point military academy. The fort’s development was hindered from the beginning by inadequate funding and the soft riverbed on which it was built. 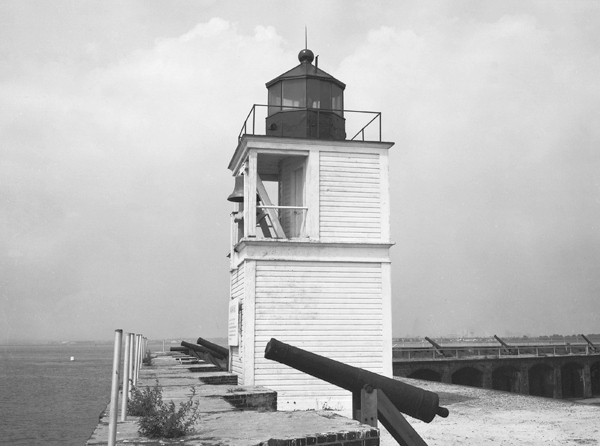 On August 31, 1852, Congress provided $1,500 for a beacon light at Fort Carroll, “when said fort shall be so far completed as to receive the same,” and a keeper’s dwelling with a light atop its roof was erected at the fort in 1854 to warn ships of the large construction site and to indicate the path from Brewerton Channel to Fort McHenry Channel. At that time, Martin Kasson, the light’s first keeper, was the sole resident of the fort. The temporary lighthouse was equipped with a fifth-order lens that produced a fixed white light, and a fog bell, tolled by machinery was added in 1855. By the time of the Civil War, the fort’s walls were less than half of their originally intended height. The government was insistent on making the most of it, however, and thirty guns were placed there to defend Baltimore Harbor against Confederate incursions. Robert E. Lee’s project was therefore ironically turned against his southern forces, although no actual hostile shots were ever fired from the fort. In fact, in 1864 heavy rains flooded the fort, and all of the ammunition and gunpowder were transferred to nearby Fort McHenry. The skeleton frame structure from which the light was displayed was removed from the roof of the keeper’s dwelling in 1875, after a wooden tower was erected atop the fort’s southwest salient. The lens and bell were transferred to this new structure, and its light was exhibited for the first time on May 5, 1875. A small frame oil house was built at the station in 1881, and in September and October of 1888, a new keeper’s dwelling was built at a cost of just over $1,000. This two-story residence was built of yellow pine and measured twenty by twenty-five feet. The Spanish American War prompted substantial changes to the fort and the lighthouse. In October 1898, the light and fog bell tower was demolished so that new concrete gun batteries could be put in place. The Army equipped these batteries with guns similar to those in battleships, including bore sizes of fifteen, twelve, and ten inches. While the weapons were in readiness by 1900, hostilities with Spain had by then ceased, and once again the fort did not see combat action. 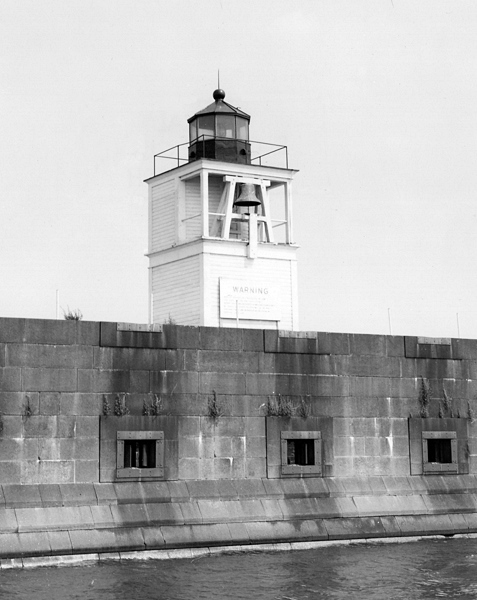 A temporary light was exhibited from a lens lantern and the fog bell was rung by hand, while a replacement lighthouse, containing both the fifth-order Fresnel lens and a machine-operated fog bell, was quickly built. This structure was approximately 100 feet north of the old tower, and its light, which shone from 45 feet above mean high tide, was first activated on December 30, 1898. 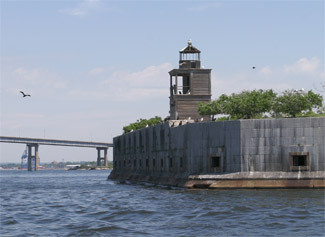 In 1900, structural changes to the fort required the tower to be temporarily moved 100 feet to the south, and when it was returned to its original location, a red sector was inserted in the light to mark the turn from Brewerton Channel to Fort McHenry Channel. The following year, the casement beneath the lighthouse was destroyed, leaving the lower story open. This opening was quickly enclosed with tongued and grooved lumber, and the structure has remained much as it is to the present day. As the tolling of the bell caused vibrations of the lantern room that “seriously affected the light,” a new frame for the bell was made in 1901 that freed it from the flooring of the lantern room. The massive fortress was by this time essentially obsolete, though it did serve some functions of varying importance during the two World Wars. After America became involved in the first European conflict, the garrison was used as a staging area for personnel mining Baltimore Harbor against enemy ships. The gun batteries were also used for practice firing. By 1921, however, the Army had abandoned the post and taken all of its weapons to Fort Howard, near the mouth of the Patapsco River. Fort Carroll Lighthouse was automated in 1921, by changing the illuminant to acetylene gas and the fog signal from a bell operated by clockwork to a bell operated by compressed gas. Theodore Schlatzer, the last keeper, was transferred to nearby Seven Foot Knoll Lighthouse. In World War II, the Coast Guard utilized the four man-made acres as a pistol range, and also as temporary quarters for foreign sailors whose ships had to be fumigated before entering the harbor. Fort Carroll gradually succumbed to decay and neglect after the war years, though such a huge and intriguing structure did inspire some offbeat ideas for its use. One such plan came from the Baltimore mayor’s office and called for a statue of Lord Calvert on the site that would approach the Statue of Liberty in scale. This was not entirely far-fetched, as New York’s icon had been raised on the ruins of Fort Wood in that city’s harbor. There was also the notion that the inaccessible acres could be employed as an Alcatraz-style prison camp, or a museum. In 1958, the government sold the fortress to Baltimore lawyer Benjamin Eisenberg, who paid about ten thousand dollars to acquire the property and intended to turn it into a casino. Apparently there were powerful figures who disagreed with this plan, for it was found that the ambiguous county boundaries placed that section of the harbor outside of gambling-friendly Anne Arundel County. Eisenberg went looking for another use for the fort, but in the meantime he repaired its broken walls and planted a great number of peach trees. In 1964, Eisenberg leased the land to Robert Jackson, an entrepreneur who intended to use the grounds for tourism. Jackson used a hydrofoil named Baltimore Clipper to ferry passengers to the fort, but this venture failed to turn a profit and was soon called off. Fort Carroll Lighthouse remained active until 1964, when it was taken out of service by vandals and never repaired. The formerly landscaped interior of the fort has turned into a jungle of vines, weeds, and trees. The masonry and concrete of the fort are slowly disintegrating, and birds have taken up residence and covered the parapets with their droppings. There are many who see positive developments in this unique habitat, however. An oyster reef restoration effort is centered around Fort Carroll, and the site also serves as a testing ground for wildlife monitoring and water quality. In the midst of Baltimore’s industry and infrastructure, Fort Carroll has become the most manifold habitat of bird species in a 100-mile radius. This is both a good and a bad thing, however, for the peach trees in which the birds nests are undermining the foundation of Fort Carroll. It may come to a point where either the nesting sites or the historic monument will have to be sacrificed. In 2004, the fort was owned by Struever Bros. Eccles & Rouse, but a few years later, Fort Carroll LLC was listed as the owner. Head Keepers: Martin Kasson (1854 – 1863), Donald Wilkinson (1863 – 1864), George McCracken (1864 – 1869), James Boyle (1869 – 1873), James E. Meeds (1873 – 1901), Sarah E. Meeds (1901), George F. Culleton (1901 – 1911), William K. Slacum (1911 – 1914), Theodore Schlatzer (1914 – 1921). The Lighthouses of the Chesapeake, Robert de Gast, 1973. Fort Carroll Website, Brian Hawley. “Shedding Light on Fort Carroll,” Gregg Stone, Lighthouse Digest, October 2003. 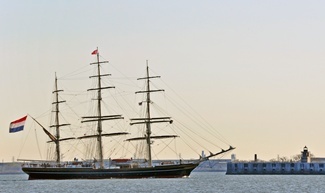 Located on a small island just east of the Interstate 695 bridge over the Patapsco River. For a larger map of Fort Carroll Lighthouse, click the lighthouse in the above map. This light is best viewed from a boat, but a distant view is possible from Fort Armistead Park on the western bank of the Patapsco River near the Interstate 695 bridge. 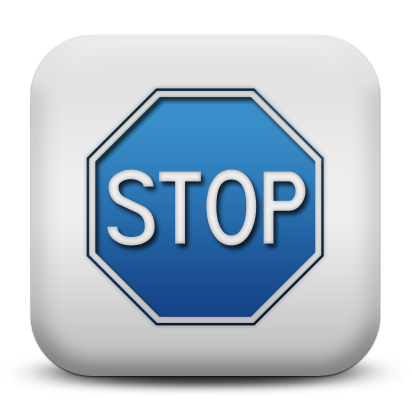 To reach the park, take exit 1 from Interstate 695 and drive south on Quarantine Road to Hawkins Point Road. Go east on Hawkins Point Road to Fort Armistead Road, which will take you to the park. 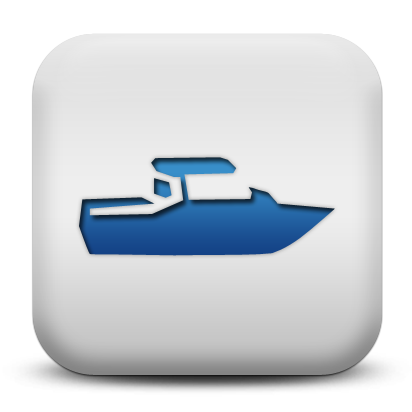 We visited the lighthouse with Down Time Sportfishing Charters. The fort and lighthouse are owned by Fort Carroll LLC. Grounds/tower closed. Every year since 1972, the Coast Guard has been placing a ceremonial buoy, painted like the U.S. flag, to mark the approximate location in the Patapsco River near Fort Carroll where Francis Scott Key witnessed the British bombardment of Fort McHenry and penned the words to the Star-Spangled Banner. 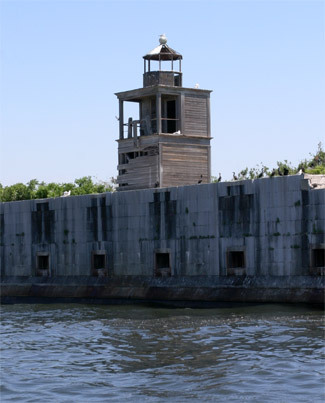 Keep an eye out for the buoy, if you make a trip out to get a closer look at Fort Carroll Lighthouse.